In the following article I’ll be discussing and demonstrating several different ways of how images can be put on a report. I’m using SQL Server Reporting Services 2008 R2 CTP, more precisely version 10.50.1352.12, but the methods explained here will work on any SSRS 2008. Furthermore I’m using the AdventureWorks2008R2 database, available at CodePlex. The resulting report, including image files, can be downloaded from my Skydrive. The marketing department has requested a product catalogue. 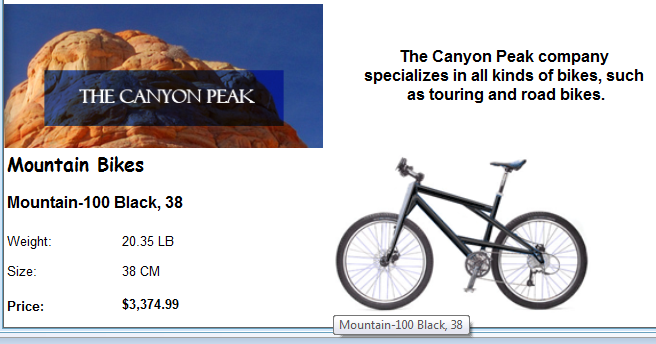 This catalogue should contain all products produced by our two daughter companies: The Canyon Peak and Great Falls Soft. The catalogue should be grouped on company, with the next company's products starting on a new page. 1. Each page needs an image in its header, with even pages displaying a different image than odd pages. 2. Each company has a logo. The logo should be displayed in the company’s header. 3. Each product has a logo. The logo should be displayed as part of the product details. A design document containing the expected layout, including all image material, has been provided. I’m not going into the details of this query. Let’s just say that I’m manipulating data from the database in combination with some hardcoded data to get usable data for our example. I’ve added some comments to make it clear what the query is doing. If you have a look at its output, you’ll see that it produces a list of products with some additional fields. To get started, open up a SSRS solution, add a new report, add a data source connecting to your AdventureWorks 2008 R2 DB, and add a dataset using the above query. The first way of adding images to a report that we’ll take a look at is by embedding them inside the report. Looking at the scenario requirements described earlier, this is requirement 1. Let’s add a header to the report. In the BIDS menu, select Report > Add Page Header. If you don’t see the Report menu item, you probably have not selected your report. Click your report in the Design view to select it. 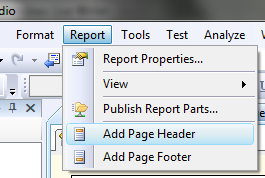 From the Toolbox, drag the Image report item onto the header portion of the report. Doing that will show a pop-up window, the Image Properties. By default, the Select the image source combobox is set to Embedded. Good, that’s what we need at this point. What we now need to do is import an image into the report, using the Import button. Clicking the Import button shows a common file Open dialog. Our marketing department has given me two images for use in the header: Cloudy_banner.png and AnotherCloudy_banner.png. Let’s select the first one. If you don’t see any images, have a look at that filter dropdown as highlighted in the screenshot above. By default this is set to JPEG files. On the Size page, select Clip instead of Fit proportional. This is a setting that you’ll need to look at case per case. For our header images, Clip is the most suitable option. As you can see, we now have an image in the header. But we haven’t fully implemented the requirement yet. The even pages should display a different image than the uneven ones. To be able to do that, we’ll first add the second banner image to the report. 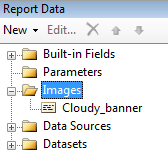 In the Report Data pane, locate the Images node and open it up. You’ll notice that the image that we inserted earlier can be found here. Right-click the Images node and select Add Image. That opens up the familiar file Open dialog which was used to add the first image. 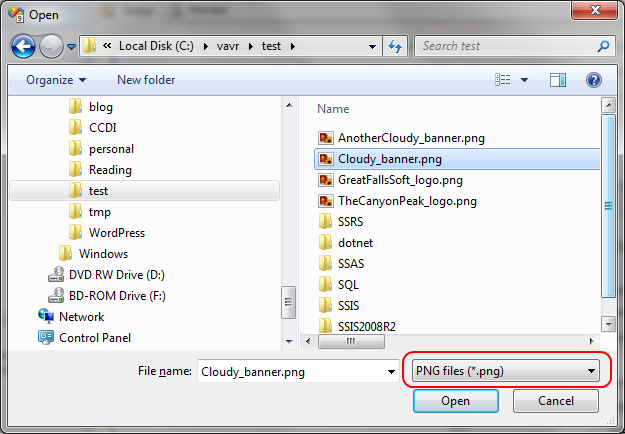 So I’m now selecting the file called AnotherCloudy_banner.png, after changing the default filter to PNG. After clicking OK, the image gets added under the Images node. With the second image added, all that remains to be done is tell the header that it should pick different images depending on the page number. Right-click the image in the header and select Image Properties. On the General page, when you click the dropdown of the setting called Use this image, you’ll notice that there are two values now. These are the same values as displayed in the Report Data pane. And these are the values to be used in the expression that we’ll create to rotate the images depending on page number. This is a fairly simple expression, using the Mod operator and the IIF() function. When page number can be divided by two, which means it’s an even page number, Cloudy_banner is displayed. Otherwise the other banner is displayed. That’s it, the report header is finished. When you have a look at the report in Preview, it should now show the second banner on the first page – this is an uneven page. To conclude this chapter I’d like to mention that this method is usually not the preferred one. A disadvantage here is that the images are stored inside the report RDL and thus cannot be modified without altering the report itself. To have a look at the RDL yourself, just right-click the report in the Solution Explorer and select View Code. On to requirement number two! At the moment, the report body is still empty, so drag a Table onto it. Put the Table in the upper-left corner, remove one of the columns so that two remain, remove the Header row and make it a bit wider. Now set the DataSetName property of the Tablix to the name of your dataset, in my case that’s dsProducts. The report should display the data grouped on company, so right-click on the line that says Details in the Row Groups window part at the bottom of the Design View. Select Add Group > Parent Group. We’ve now got an empty tablix with two columns, a Details row and a Company header row. In our dataset, one of the fields is called CompanyDescription. Hover the mouse pointer above the textbox in the top-right, click the small icon that appears and choose the field from the dropdown that appears when you click the icon. To add the company’s logo, drag an Image from the Toolbox pane into the textbox on the left of the company description. Doing this opens up the by now familiar Image Properties dialog. Give it a good name, such as CompanyLogo, and select External as image source. When using External as image source, the image expression should result in a valid URL, any valid URL. In my example the files are located in a local folder called c:\vavr\test. Keep in mind that, when you deploy the report to a server, the images should by located in that same folder, this time located on the server. By default the image gets displayed using the Fit Proportional setting. You can verify this in the Size page of the Image Properties. 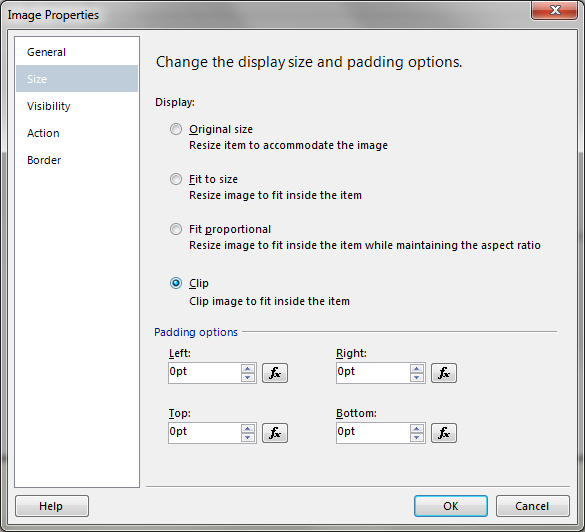 We want the image to get fully displayed while maintaining the aspect ratio, so leave the setting as it is. 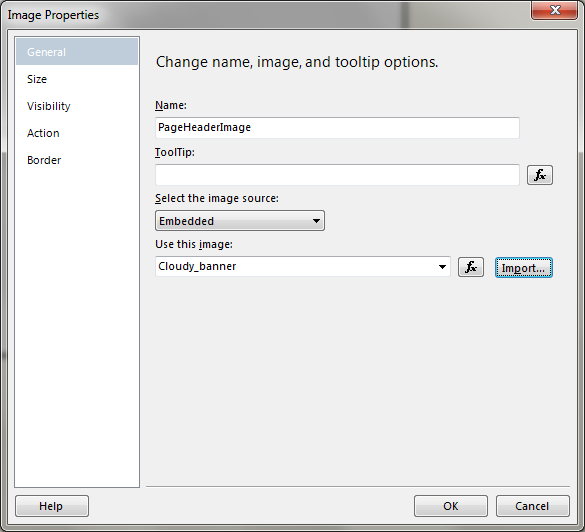 Close the image properties dialog. Vertically enlarge the first row in our tablix to an acceptable size. In my case the marketing department specified to use a height of 1.5 inches for the company logo. With the image selected, locate the Size > Height property and set it to “1,5in”. Note that the decimal separator used here depends on your local settings. Note that I’ve removed the borders of all textboxes by setting their BorderStyle property to None. With the logo images implemented we have fulfilled requirement two. On to number three. In this last requirement we’ll have a look at displaying images that are retrieved from the database, also known as data-bound images. The retrieving part is actually already implemented. In our dataset there’s a field called LargePhoto, that one contains a picture of the product. Let’s add some product details and a picture in that remaining blank row. To get full control over layout I want to make the detail part of the tablix a freestyle part. First merge the two cells together by selecting both of them, then right-click and choose Merge Cells. 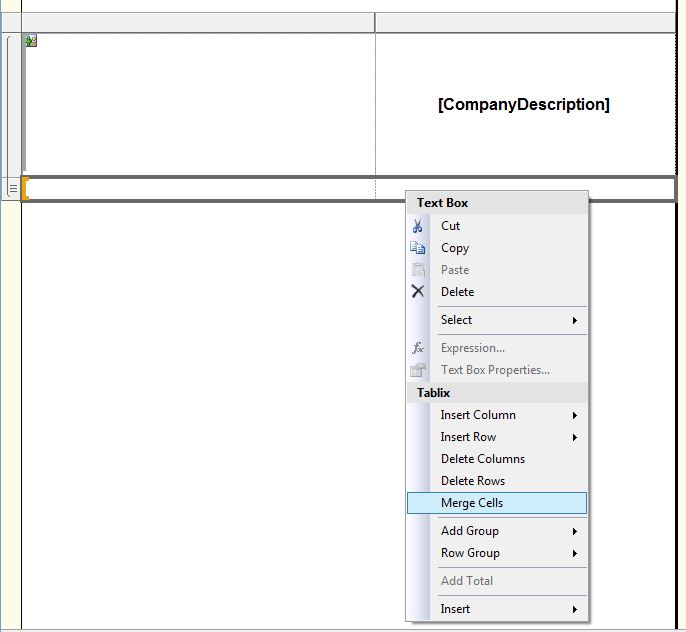 Now select a Rectangle in the Toolbox pane and drop it into the merged area. To add fields such as Subcategory and Product you can just select them from the Report Data pane and drop them inside the rectangle. I’m also adding some additional labels and fields, as shown in the next screenshot. 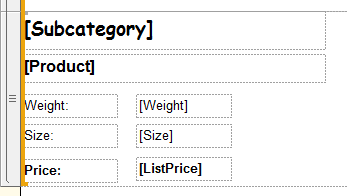 For the layout of the price field I’ve just entered C in the Format property of the textbox. With the textual product details completed, all that remains to be done is adding the product image. Again we get the familiar Image Properties popup. 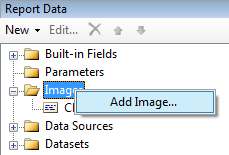 Give it a good name, like ProductImage, and select the image source that we haven’t used yet, Database. In the Use this field dropdown, select LargePhoto, and select image/gif as MIME type. Note: the images are stored as GIF. You can verify this by running a select on the Production.ProductPhoto table. Looking at the LargePhotoFileName field we see that the extension is .gif. Click sufficient OK buttons until the properties dialog is gone, then resize the image placeholder so that it occupies the remaining whitespace. 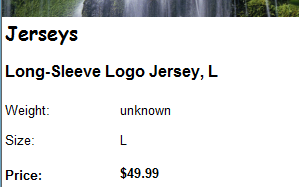 When hovering the mouse pointer above the product image, you’ll get a nice tooltip. In this article I have illustrated the three possible methods of adding an image to your Reporting Services report.